Sometimes we just need to eat something green. I’ve gotten in the habit of serving cooked veggies or a raw salad with every meal. It’s a way to ensure I’m getting enough veggies (HA like that’s ever a problem) and also I like meals that have lots of components. If you’ve ever been out to eat with me, you know we’re ordering 5 different apps as our main course. 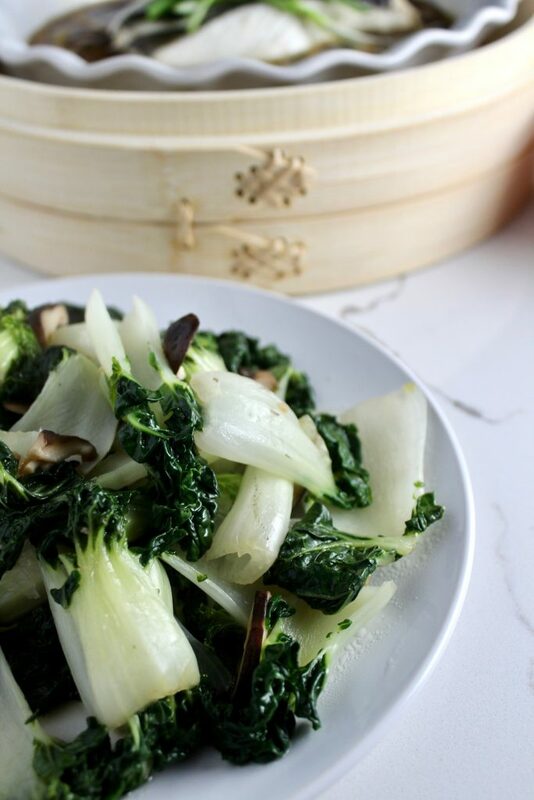 This Bok Choy and Shiitake Mushroom recipe was the perfect side dish to the Halibut with Lily Buds and Dried Shiitake Mushrooms I made the other night. This recipe makes enough for 4 large servings, or 6 smaller ones. And you can swap out bok choy for anything really – asparagus? brussels? kale? The sauce is so easy and flavorful, yet there’s almost nothing to it. I particularly love this recipe because it’s a good model for how to cook veggies on the stove so they don’t get mushy. Remove from heat/steam for a few minutes. Enough chit chat, let’s get our greens. Start by heating up your oil on a large skillet or wok. The oil should shimmer but not smoke. If you’re using baby bok choy, you can just cut the bottom tough part off. 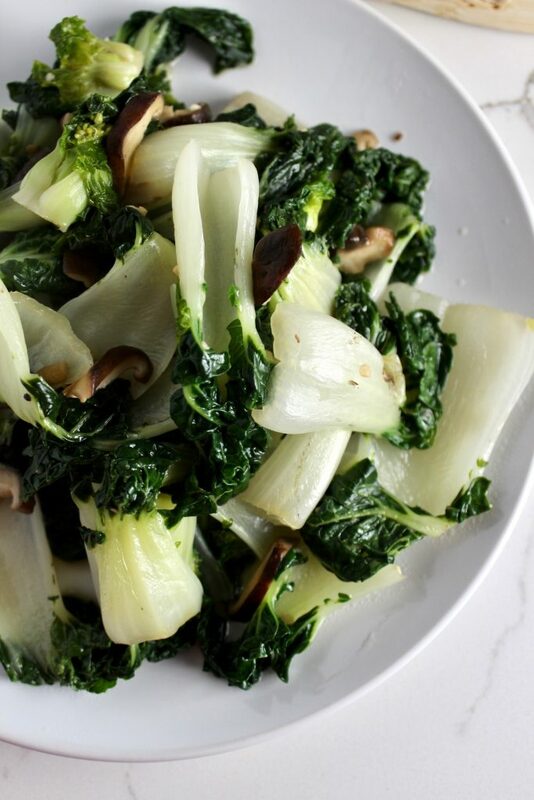 If you’re using regular sized bok choy, slice these into three inch pieces. Slice your mushrooms into thin pieces. Once your oil is hot, add your chopped garlic, stir for about 5 seconds (don’t let it burn!) then add your mushrooms. Cook for about 30 seconds, then add your rice wine and bok choy. Mix everything together, then add your fish sauce and water/stock. 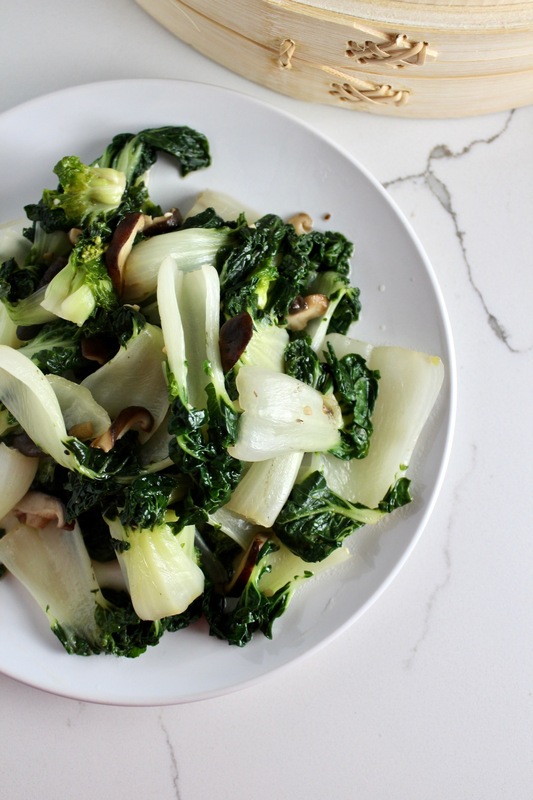 Let cook for about 2 minutes, your bok choy will likely still be crisp at this point. Remove from heat and cover the pan with a lid. The bok choy will cook in here while you prep your other food. Let this rest for about 5-8 minutes, then your greens will be perfectly cooked and ready to eat.